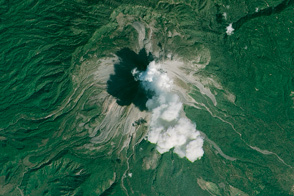 It is one of Central America’s most active volcanos. 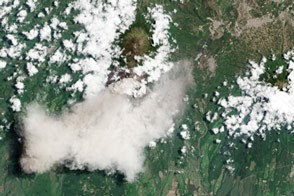 Volcán de Fuego puffs continuously without notice by nearby communities, punctuated by episodes with explosive activity, huge ash plumes, and lava flows. The Guatemalan volcano is at it again, beginning its latest bout of unruly behavior on January 31, 2018. 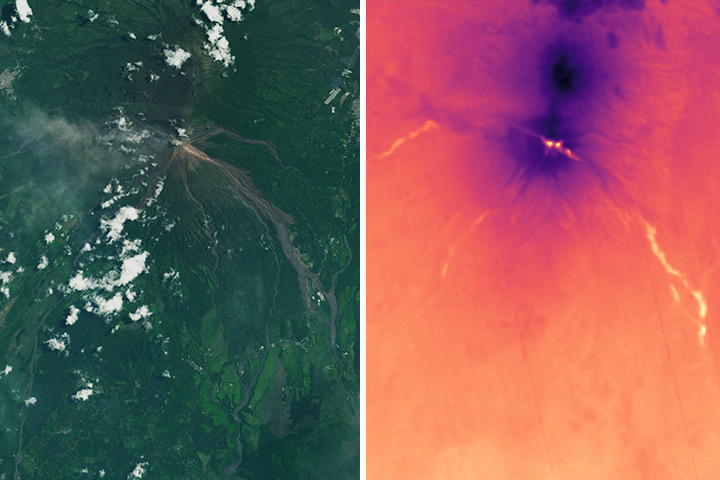 On the next day, the Operational Land Imager (OLI) on Landsat 8 captured these natural-color images of the eruption. 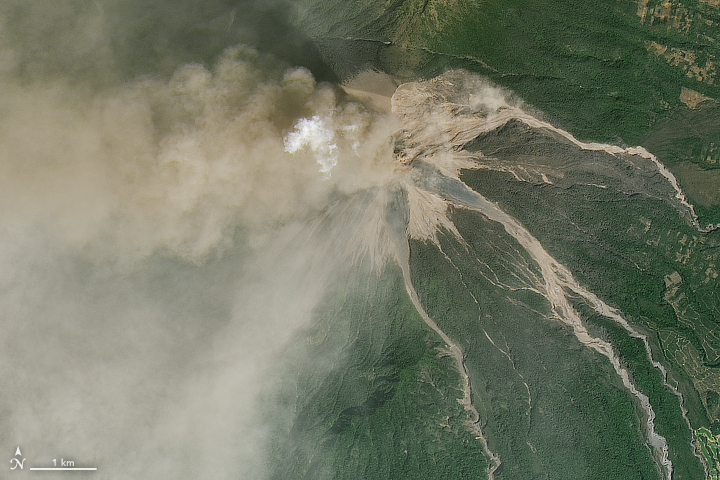 Ash in a volcanic plume typically appears brown or gray, while steam appears white. You can see a wider view of the volcano here. 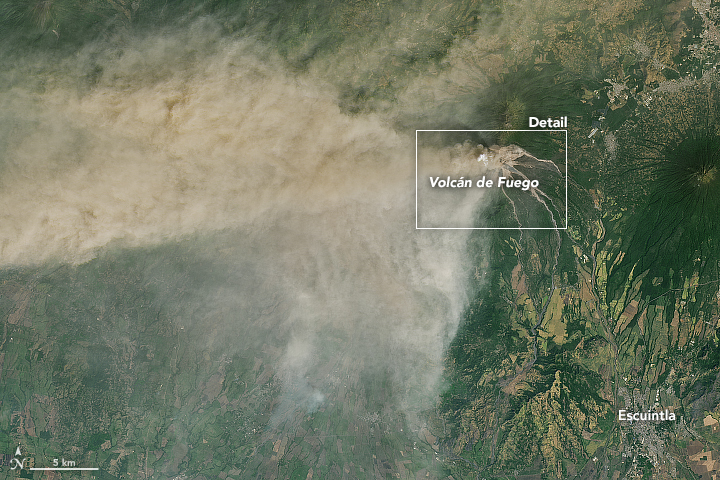 Fuego is located about 70 kilometers (40 miles) west of Guatemala City. According to the Coordinadora Nacional para la Reducción de Desastres (CONRED), the plume reached an altitude of 6,500 meters (21,300) feet above sea level and was carried 40 kilometers (25 miles) to the west and southwest by the winds. 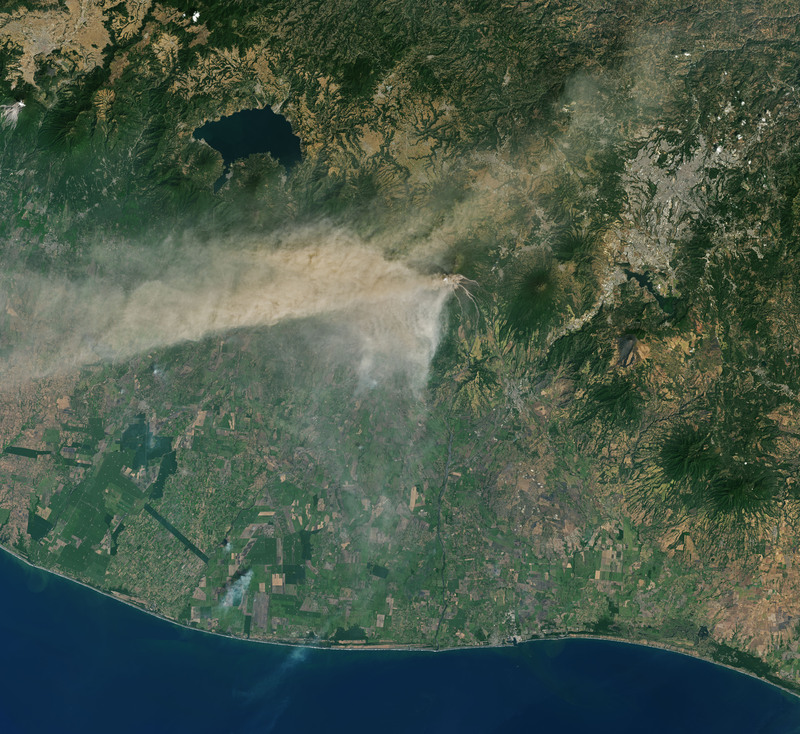 Falling ash affected tens of thousands of people, primarily in the provinces of Escuintla and Chimaltenango. Lava from two active conduits flowed through four ravines, leading officials to preemptively close National Route 14 to vehicles. 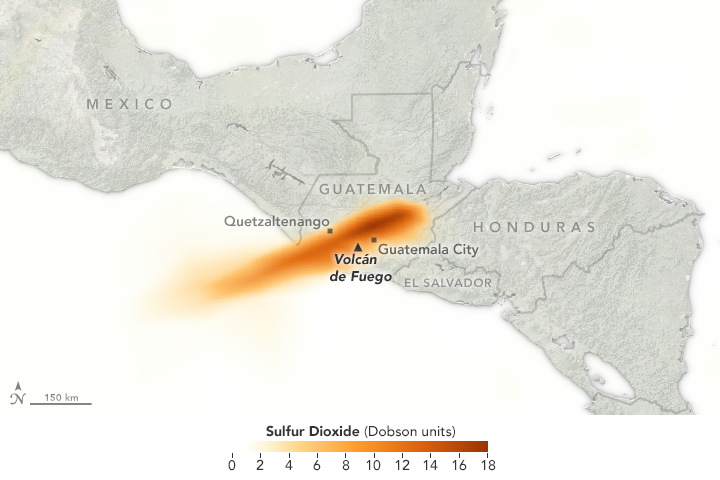 In addition to ash, the plume contains gaseous components invisible to the human eye, including sulfur dioxide SO2. 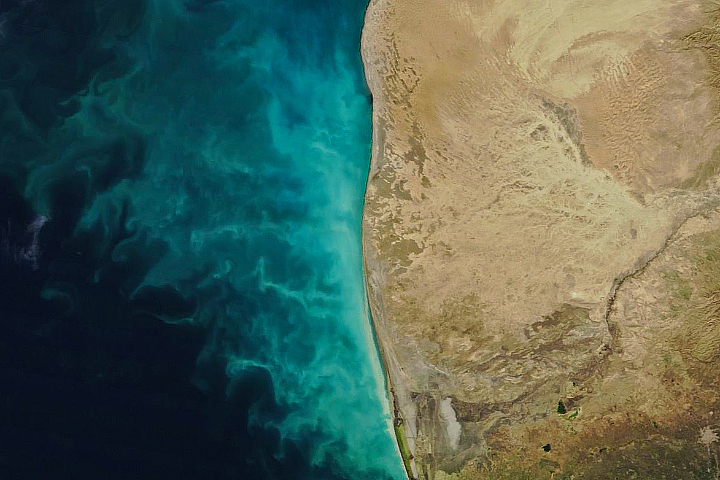 The gas can affect human health—irritating the nose and throat when breathed in—and reacts with water vapor to produce acid rain. It also can react in the atmosphere to form aerosol particles, which can contribute to outbreaks of haze and influence the climate. The map above shows concentrations of SO2 detected on February 1 by the Ozone Mapper Profiler Suite (OMPS) on the Suomi National Polar-orbiting Partnership (Suomi-NPP) satellite. 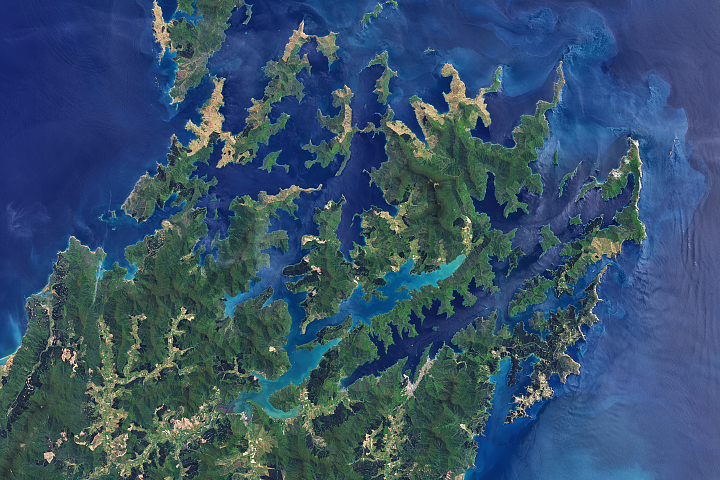 NASA Earth Observatory images by Joshua Stevens, using Landsat data from the U.S. Geological Survey and OMPS data from the Goddard Earth Sciences Data and Information Services Center (GES DISC). Story by Kathryn Hansen. 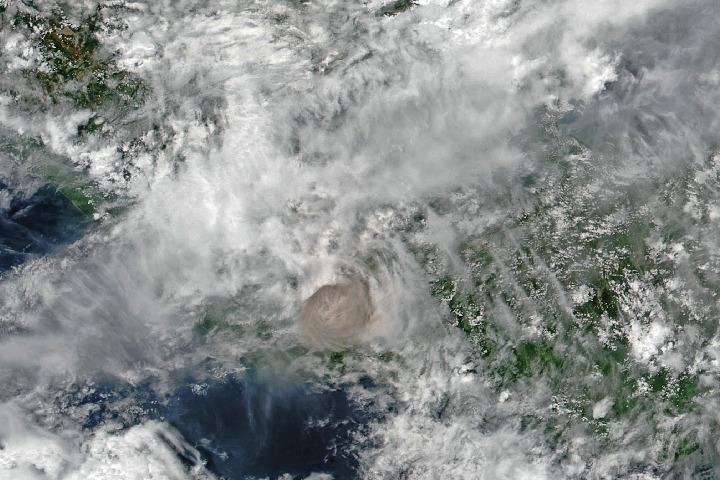 The Guatemalan volcano is at it again, beginning its latest bout of unruly behavior in late January 2018. Volcán de Fuego, an active volcano in Guatemala, erupted for the first time in 2018. 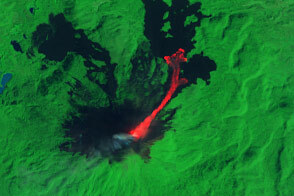 Satellites acquired imagery and data of the event. Coordinadora Nacional para la Reducción de Desastres (2018, February 1) Boletín Informativo No. 222018. Accessed February 2, 2018. Coordinadora Nacional para la Reducción de Desastres (2018, February 1) Boletín Informativo No. 212018. Accessed February 2, 2018. 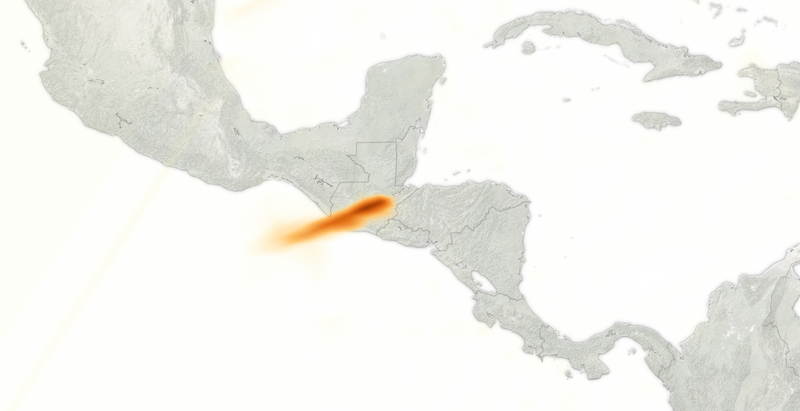 LANCE/EOSDIS Rapid Response (2018, February 1) Eruption of Fuego Volcano, Guatemala. Accessed February 2, 2018. Smithsonian Institution Global Volcanism Program (2018, February) Fuego. Accessed February 2, 2018.